Shinsengumi: The Shogun's Last Samurai Corps is the true story of the notorious samurai corps formed in 1863 to arrest or kill the enemies of the Tokugawa Shogun. The only book in English about the Shinsengumi, it focuses on the corps' two charismatic leaders, Kondo Isami and Hijikata Toshizo, both excellent swordsmen. It is a history-in-brief of the final years of the Bakufu, which collapsed in 1867 with the restoration of Imperial rule. In writing Shinsengumi, Hillsborough referred mostly to Japanese-language primary sources, including letters, memoirs, journals, interviews, and eyewitness accounts, as well as definitive biographies and histories of the era. The fall of the shogun's government (Tokugawa Bakufu, or simply Bakufu) in 1868, which had ruled Japan for over two and a half centuries, was the most significant event in modern Japanese history. The revolution, known as the Meiji Restoration, began with the violent reaction of samurai to the Bakufu's decision in 1854 to open the theretofore isolated country to "Western barbarians." Though opening the country was unavoidable, it was seen as a sign of weakness by the samurai who clamored to "expel the barbarians." Those samurai plotted to overthrow the shogun and restore the holy emperor to his ancient seat of power. Screaming "heaven's revenge," they wielded their swords with a vengeance upon those loyal to the shogun. They unleashed a wave of terror at the center of the revolution--the emperor's capital of Kyoto. Murder and assassination were rampant. By the end of 1862, hordes of renegade samurai, called ronin, had transformed the streets of the Imperial Capital into a "sea of blood." The shogun's administrators were desperate to stop the terror. A band of expert swordsmen was formed. It was given the name Shinsengumi ("Newly Selected Corps")--and commissioned to eliminate the ronin and other enemies of the Bakufu. With unrestrained brutality bolstered by an official sanction to kill, the Shinsengumi soon became the shogun's most dreaded security force. 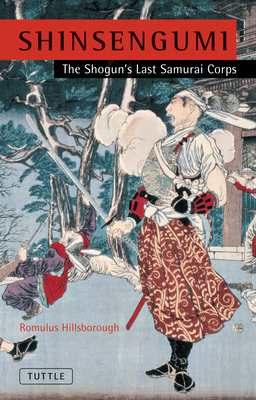 In this vivid historical narrative of the Shinsengumi, the only one in the English language, author Romulus Hillsborough paints a provocative and thrilling picture of this fascinating period in Japanese history.